datelined to the period 1700 to 1840. Welcome to our website, selling Eighteenth and Early Nineteenth Century prints - from the Georgian Era. We mostly specialise in topographical and architectural prints - buildings and views of places, but there are also some carefully selected other prints, such as portraits. Thanks to all our visitors and customers for visiting and buying from the site - we hope you find some prints to interest you. If you are new to old prints, information on print making is available through the menu on the left. If you have any queries, do please email us. 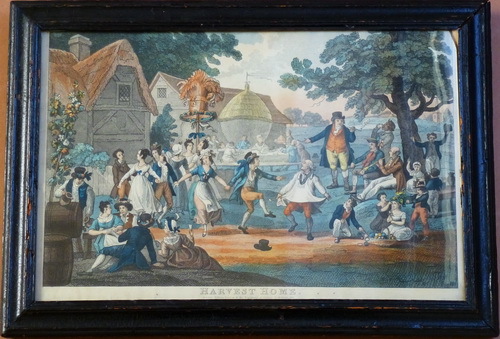 ‘HARVEST HOME’ A charming early C19 print in a period frame £125-00 - EMAIL for full details. prints for sale are listed from places one down to miscellany - just click on a button ! !